Oh man, didn't realise that the con already happened. I'll have to catch up and see what happened. While not related to Penders himself, this post talks about what he's complaining about since years, so I guess it's the right place for it, as this discussion is also about legal issues and stolen content and design. I put it in spoilers, it's kinda big due to links been changed into inserted media. STC isn't innocent, especially when it comes to Kintobor. But when you look at Doctor Who, things go crazy like hell. 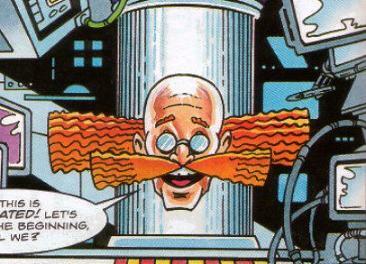 First Robotnik being able to change his appearance at will, clearly a ripoff of the regeneration. 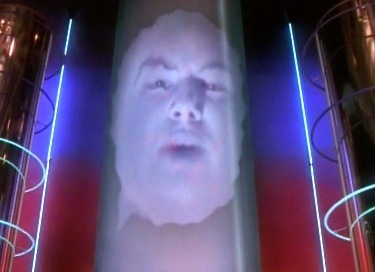 The Tardis used the full column for the first time in 1995. Then in 1997, Kintobor Computer was uploaded on this device. 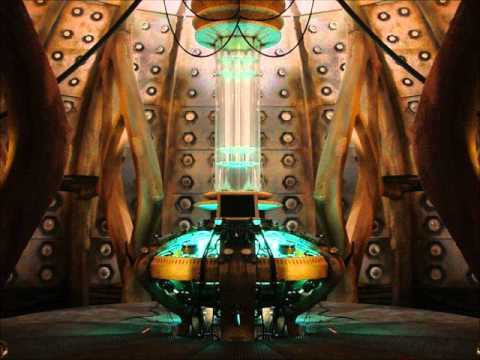 So I guess it was only fair game when they made the 2005 Tardis almost identical. It even has the external screen plugged to the main console, which was never seen before. And that's only what I'm aware of. They would have had a lot of troubles if they did that now. Who knows, maybe there was a darker reason behind it's cancellation, and everyone had do be dead silent about it, like for Archie today. And it seems Doctor who still hasn't finished taking its revenge on Sonic, as shown by the first part of this scene. Doctor Who: Long running British TV show. British Comic contains homages to British TV show, not that shocking. Especially that 1) it's just one image and 2) it's not that unique of a control console anyway. Oh, yeah. Britain also isn't as crazy about copyright as the US, and the BBC didn't really care about Dr Who till it came back in 2004. So any conspiracy about the BBC being behind StC cancellation is unfounded. Jokes on BBC, the comic is still alive. Homage is a one time thing, what I'm showing are litteraly parts of the main plot and going for multiple issues. I know for sure since I read the whole comic. And I'm not pointing at the BBC for the cancellation, what I meant is that Sega probably put an end to it because it took too many "inspiration" from other works and wasn't original enough. I mean come on, that story with Metal Sonic and time travel to prevent one of Robotnik's machines to take over Miracle Planet was litteraly called "The Sonic Terminator." And don't make me start on the Marxio Brothers. Shortfuse is litteraly an "Iron-Squirrel". A giant ancient alien ring to travel to other worlds. Look, I like this comic, but those are all plot elements, you can't call them mere references. Of course there are some stuff like that in the Archie comic, but those were mostly easter eggs or one time stores that were just alternate universes. The whole iron-squirrel thing I don't personally see as taking after iron man considering all the badniks are literally animals in suits. Shorty was no exception only he was put in one he could not escape from until near the end of the comics. Look... this isn't a conspiracy here. I don't think I know the most about all the comics but I really think you're just analysing the comics way too deeply here. They failed because they ran out of money not cause SEGA went "hey... you're stealing too many ideas"
Also, Archie Sonic had a Sonic Terminator too! He even spouted the catchphrases. StC probibly failed because interest in Sonic was declining, the comic wasn't aging with its readership as Archie was, comics as a general rule don't have massive readerships, and... to be frank, while it had it's moments, it wasn't that great. The thing I liked least is Mick McMahon's design. The drawing themselves aren't bad, but he barely changes character's facial expressions. Anyway, let's not go too far away from topic. Back to Penders. No matter what we think or say, the fact is that Archie never made him sign any document saying his work could become their property, so his creations were always his, which also means that any revenue from reprints and use of his characters after his departure without his consent was illegal. The real people to blame are Archie's careless and stupid lawyers from the time. Want an example of good lawyers ? The ones at Bongo Comics. They wouldn't allow them to publish Simpsons fan arts unless the persons who made them state that they become Bongo's property. You got it backwards, Bongo's lawyers didn't persecute fans. That's my fault actually, I wasn't clear enough. What I meant is that they wouldn't allow Bongo Comics to publish fan arts in the comics unless they were given full rights by the persons who made them. It's the opposite of Youtube. That still sounds pretty draconian. "Here's a drawing I made of a character I love that I'm doing for free." I actually feel bad for arguing with Penders now. No wonder he's so grumpy now -a-days. Everyone keeps wanting to point to him as the bad guy when it's really archie, which I'm really starting to see with how the company has been acting lately, and people wonder why I don't want them publishing sonic comics anymore. Pender's isn't a saint in all of this. Sure, he's not the boogeyman that some have portrayed him, but Archie isn't the only villain. This isn't a black and white situation. It's very much greyscale. Sadly true. I do think he has some truth to what he said about Sonic not begin published by Archie past 2016. I know you guys are gonna get mad at me for this, but the whole series in itself isn't looking too good to begin with (the sonic games). Yet that's paradoxical considering Matt Groening always complained about lawyers being everywhere, when you see the results of Archie having lax lawyers. I think it's hard because they've tried plenty of times to deviate from the original formula to make the new Sonic games feel fresh and innovative to a new age audience, with new gimmicks and unnecessary additions, but it's deviated so far from the old games that it's turned away it's older audience, and it's hard trying to please both at the same time. Honestly though, A Sonic Adventure remake with better graphics and more stable gameplay would be a blessing for them. It would not only give the older audience a chance to relive their favorite moments with the power of new age game software and the younger players a chance to see how sonic games used to feel like but without the rather badly-aged graphics and somewhat buggy gameplay. I know it makes me want to try and get into Sega once I finally get my 3-D animation degree, just to try and help make a better sonic game that would appeal to both the older and younger sides of the fanbase. And if I can't get to the games then i'd definitely love to get my hands on re-making the SatAM cartoons at least.